TORONTO – Oliver Stone’s docudrama “Snowden”, with Joseph Gordon-Levitt as NSA whistle-blower Edward Snowden, is a typically well-crafted Stone film that combines biography with a passionate defense of the man’s actions. 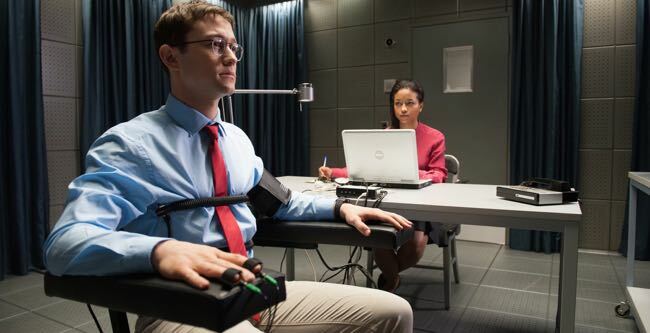 Snowden is a hero in Stone’s eyes and his gripping and informative picture makes a convincing case. The film had its world premiere at the Toronto International Film Festival today and it will screen at the BFI London Film Festival on Oct. 15 ahead of national release in North America. British distribution is still to be announced. Director Stone and co-writer Kieran Fitzgerald based their script on a suspenseful non-fiction book, “The Snowden Files” by Luke Harding, a reporter for The Guardian, the newspaper that broke the story of the National Security Agency’s global surveillance operation. It also draws from “Time of the Octopus”, a novel by Russian attorney Anatoly Kucherena, who has represented Snowden’s interests since he has lived in Moscow. The film starts in a Hong Kong hotel as Snowden reveals to documentarian Laura Poitras (Melissa Leo) and Guardian reporter Glenn Greenwald (Zachary Quinto) the classified information he acquired from the NSA’s secret underground facility in Hawaii. The film about Snowden that Poitras made with Mathilde Bonnefoy and Dirk Wilutzky, titled “Citizenfour”, won the Academy Award for best documentary in 2015. In Stone’s version, Snowden relates much of his life story for Poitras’s camera and tells of the events that led to his decision to blow the whistle on what he viewed as illegal eavesdropping on millions of citizens around the world including the United States. His early dream of joining Special Forces is crushed along with the leg that buckles under fierce army training and although he quit high school to support his family, his extraordinary self-taught education, especially in languages and computers persuades the CIA to hire him. At training camp, he comes under the guidance of a strict CIA man named Corbin O’Brian (Rhys Ifans) and a disillusioned spy named Hank Forrester (Nicolas Cage). A straight-arrow believer in his country, Snowden is firmly in O’Brian’s camp until gradual exposure to dirty tricks and the NSA’s secret agenda causes him to lean more toward Forrester. Stone flashes back and forth from his hotel revelations to events in Snowden’s life including his love for a young liberal, Lindsay Mills (Shailene Woodley), his brief time in the field with a no-nonsense CIA agent (Timothy Olyphant), and the discovery of his epilepsy. Tension ratchets up as the reporters remind him that the authorities could crack down at any moment along with knowledge of the terrible retribution that had been meted out to previous members of the security community who attempted to shed light on the government’s shadowy activities. Gordon-Levitt grows plausibly from a callow computer geek to a determined activist and Woodley conveys Lindsay’s frustration with a partner who can say nothing about his work and her willingness to trust him in spite of that. Ifans (“Notting Hill) appears to be growing into another Jason Robards with a nuanced performance of a veteran spy who combines avuncular warmth with cutthroat ruthlessness. His American accent is bang-on, as is that of Ben Schnetzer (“Pride”) as one of Snowden’s sympathetic young colleagues. Familiar faces dot the cast with small but effective contributions including Tom Wilkinson, Joely Richardson, Scott Eastwood and Ben Chaplin. As usual, the director employs a variety of visual textures and he has a clever assortment of graphics and effects to keep all the complex and arcane computer programs more or less intelligible. Craig Armstrong provides a sturdy musical score that also helps to create suspense when not much is happening and Peter Gabriel supplies an apposite song titled “The Veil” for the closing credits. Venue: Toronto International Film Festival; Released: UK: TBA / US: Sept. 16 (Open Road Films); Cast: Joseph Gordon-Levitt, Melissa Leo, Zachary Quinto, Rhys Ifans, Nicolas Cage, Shailene Woodley, Tom Wilkinson, Joely Richardson, Timothy Olyphant; Director: Oliver Stone; Writers: Kieran Fitzgerald, Oliver Stone based on the books “The Snowden Files” by Luke Harding and “Time of the Octopus” by Anatoly Kucherena; Director of photography: Anthony Dod Mantle; Production designer: Mark Tildesley; Music: Craig Armstrong, Adam Peters; Editors: Alex Marquez, Lee Percy; Costumes: Bina Daigeler; Producers: Moritz Borman, Eric Kopeloff, Philip Schulz-Deyle; Production: Endgame Entertainment, Vendian Entertainment, KrautPack Entertainment; Not rated; running time 134 minutes. This entry was posted in Film, Reviews, TIFF Toronto International Film Festival and tagged 'Snowden', Craig Armstrong, Edward Snowden, Joely Richardson, Joseph Gordon-Levitt, Melissa Leo, Nicolas Cage, Oliver Stone, Peter Gabriel, Rhys Ifans, Shailene Woodley, The Guardian, Timothy Olyphant, Tom Wilkinson, Zachary Quinto. Bookmark the permalink.